Venerable Geshe Damdul Namgyal has visited several times, inspiring us with his passion for Madhyamaka philosophy and his sheer joy in sharing Buddha’s teachings. Geshe Dadul is a prominent scholar in Tibetan Buddhism. He has a Geshe Lharampa degree (doctorate) in Buddhism and Philosophy from the Drepung Monastic University earned in 1992. He also holds a Master’s degree in English Literature from Panjab University in Chandigarh, India. Author of several books on Buddhism, Geshe Dadul was also a professor of Philosophy at Central Institute of Higher Tibetan Studies at Sarnath, Varanasi, India for seven years. In addition, he has been the Spiritual Director of LSLK Tibetan Buddhist Center, Knoxville, USA. Due to his facility in both Tibetan and English, he is interpreter and speaker for numerous conferences exploring the interface of Buddhism with modern science, Western philosophy, and psychology and other religious traditions on both a national and international level. Geshela’s language ability has also enabled him to serve as an auxiliary language translator for His Holiness and Dalai Lama throughout the world. As a published author and translator, Geshe Dadul’s credits include a Tibetan translation of His Holiness the Dalai Lama’s Power of Compassion , a language manual, Learn English through Tibetan , and a critical work on Tsongkhapa’s Speech of Gold . 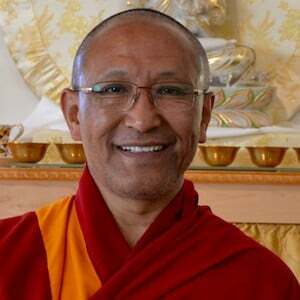 Geshela now lives and works at Drepung Loseling Monastery in Atlanta, Georgia, where he is preparing a six-year curriculum in Modern Science to be used in Tibetan monasteries and nunneries. Geshe Dadul is also on the Sravasti Abbey Advisory Board. See photos of his time at the Abbey in 2015.